IG reported that, after an earthquake swarm consisting of 62 volcano-tectonic events during 2-3 October, seismicity at Cuicocha returned to background levels on 4 October. Carbon dioxide levels were normal, and deformation data did not show any anomalies. IG reported an increase in seismic activity at Cuicocha during 2-3 October, characterized by a total of 60 volcano-tectonic events recorded at the time of the report posting. The largest of these events, a M 2.5 at 1058 on 2 October, was reportedly slightly felt by a resident of Quiroga. The Global Volcanism Program has no Bulletin Reports available for Cuicocha. 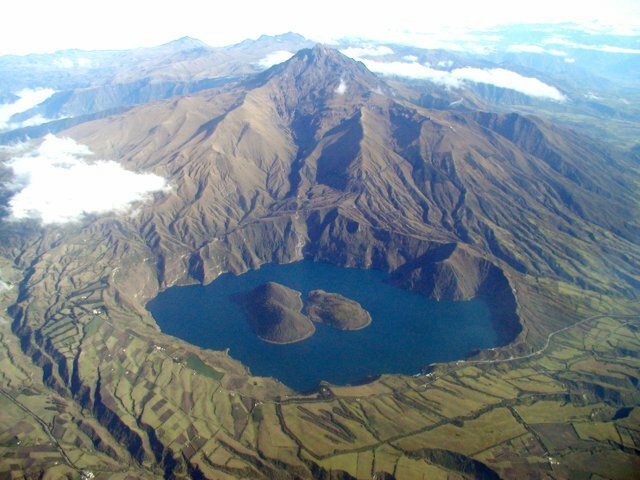 The scenic lake-filled Cuicocha caldera is located at the southern foot of the sharp-peaked Pleistocene Cotacachi stratovolcano about 100 km N of Quito. Both Cotacachi and Cuicocha were constructed along the Otavalo-Umpalá fracture zone. Eruptive activity began about 4500 years ago and continued until about 1300 years ago. The 3-km-wide, steep-walled caldera was created during a major explosive eruption about 3100 years ago that produced nearly 5 km3 of pyroclastic-flow and fall deposits. Four intra-caldera lava domes form two steep-sided forested islands in the 148-m-deep lake. A pre-caldera lava dome is situated on the outer E side of the caldera. Pyroclastic-flow deposits cover wide areas around the low-rimmed caldera, primarily to the east. Gas emission continues from several locations in the caldera lake. Hall M L, 1977. El Volcanismo en El Ecuador. Quito: Biblioteca Ecuador, 120 p.
Hall M L, 1992. (pers. comm.). Hall M L, Wood C A, 1985. Volcano-tectonic segmentation of the northern Andes. Geology 13:203-207. Hillebrandt-M C G von, 1989. The evolution of Cuicocha volcano and the volcanic hazards associated with it (abs). New Mexico Bur Mines Min Resour Bull, 131: 283. Padron E, Hernandez P A, Toulkeridis T, Perez N M, Marrero R, Melian G, Virgili G, Notsu K, 2008. Diffuse CO2 emission rate from Pululahua and the lake-filled Cuicocha calderas, Ecuador. J. Volcanol. Geotherm. Res., 176: 163-169. There is data available for 4 Holocene eruptive periods. There is no Deformation History data available for Cuicocha. There is no Emissions History data available for Cuicocha. An explosive eruption about 2900 years ago produced widespread tephra and pyroclastic surges. Subsequently a group of four dacitic lava domes was constructed within Cuicocha caldera. This marks the latest known activity from the caldera. The eastern two domes are seen here from the SE rim of the caldera. The lava domes form two forested islands in the center of the 3-km-wide caldera. Photo by Tom Pierson, 1992 (U.S. Geological Survey). Sharp-peaked Cotacachi stratovolcano rises above the caldera lake of Cuicocha volcano. The northern caldera wall truncates the flank of the heavily eroded Cotacachi. The caldera was formed during powerful explosive eruptions about 3100 years ago that produced 4.8 cu km of pumice-rich pyroclastic flows and airfall tephra that blanket the surrounding countryside. 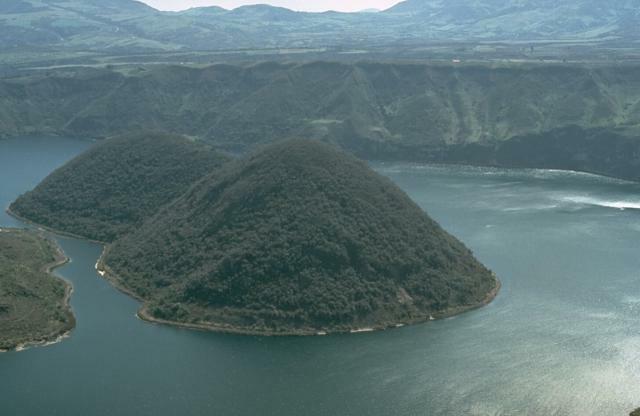 Scenic lake-filled Cuicocha caldera is located at the southern foot of the sharp-peaked Pleistocene Cotacachi stratovolcano. The caldera was created about 3100 years ago and contains a cluster of intra-caldera dacitic lava domes that form two islands in the large lake. 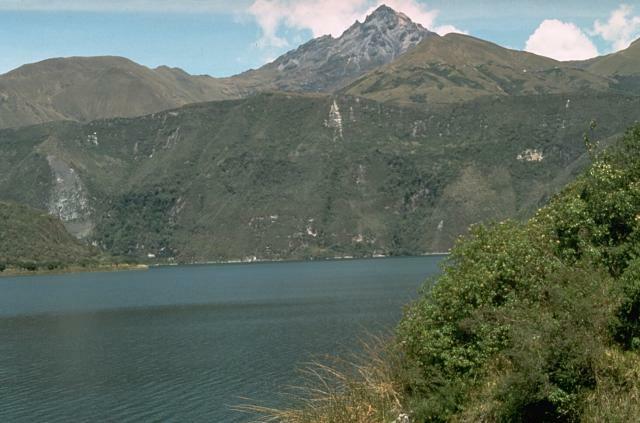 A pre-caldera Cuicocha lava dome is situated on the east side of the lake (right). Pyroclastic-flow deposits cover wide areas around the volcano. The northern caldera rim truncates the heavily eroded slopes of Cotocachi volcano. Photo by Minard Hall, 1985 (Escuela Politécnica Nacional, Quito). 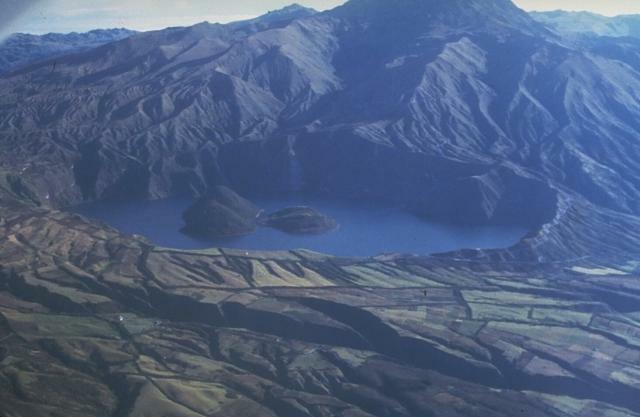 The scenic lake-filled Cuicocha caldera is located at the southern foot of the sharp-peaked Pleistocene Cotacachi stratovolcano (top center) about 100 km north of Quito. Farmer's fields encroach on the rim of the 3-km-wide caldera, which was created during a major explosive eruption about 3100 years ago. Dacitic lava domes form two forested islands in the caldera lake. Pyroclastic-flow deposits from the caldera-forming eruptions cover wide areas in now populated areas below the low-rimmed caldera. Photo by Patricio Ramon, 2003 (Instituto Geofisca, Escuela Politecnica Nacional). There are no samples for Cuicocha in the Smithsonian's NMNH Department of Mineral Sciences Rock and Ore collection. Large Eruptions of Cuicocha Information about large Quaternary eruptions (VEI >= 4) is cataloged in the Large Magnitude Explosive Volcanic Eruptions (LaMEVE) database of the Volcano Global Risk Identification and Analysis Project (VOGRIPA).